This special limited edition consists of 300 stamped, hand-numbered hardcover books in black textured leather and signed by the author on the title page. The book itself has a debossed front cover with a matte varnished cover image and foil embossed spine. 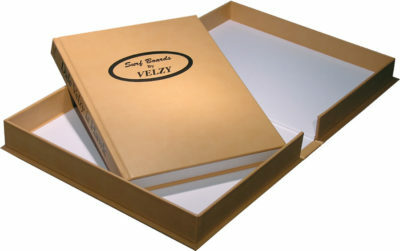 It is packaged in an elegant bonded leather slipcase, also debossed with the title on the front and spine. Decades before the expression became a marketing cliché, George “Peanuts” Larson was living the “surf lifestyle” to the fullest. Wave rider, fisherman, diver, surfboard maker, sailor and transpacific traveler, Peanuts rode the biggest wave witnessed at “Killer Dana” in Southern California, and he may well have been the first westerner ever to surf in Tahiti. This top quality, 8″ x 10″ hardcover book by author Craig Lockwood documents Larson’s life in 160 pages and with 150-plus photos. George “Peanuts” Larson was first a legend, then a myth, and finally a surfing archetype. 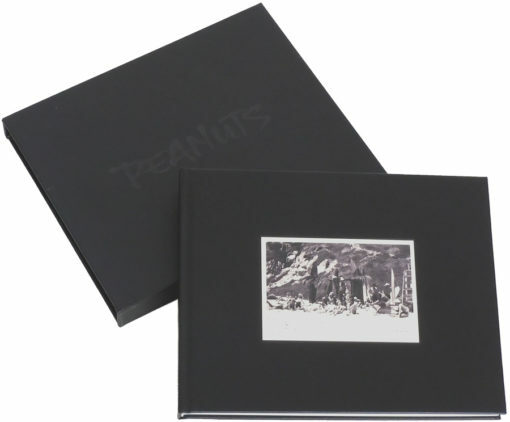 “Peanuts” An Oral Biography Exploring Legend, Myth and Archetype in California Surfing’s Subculture is simultaneously oral biography and “near history,” a term coined to describe those years that stretch just beyond recent memory’s reach, in this case the 1930s, ’40s and ’50s, often referred to as “those days,” meaning the years just before and after World War II. Every generation has its own version of “those days,” but “Peanuts” focuses on those three pivotal decades in the 20th century. Author Craig Lockwood has created a sense of Larson’s time and place, a provincial California before the waves of population that came after the war, by centering on an individual who was one of those men who was greater than the sum of his parts. Perhaps more than any other surfer of that earlier and now lost generation, including Tom Blake, Peanuts defined what would become the ordinary surfer’s quest for authentic identity. Coming of age during the Great Depression, Larson created what would become identifiable as a distinctly “surfer” persona—long before there was a media to extol or exploit it. Handsome, buffed, articulate, Larson was also a highly respected surfboard shaper, a waterman, a lifeguard, an incredible lobster and abalone diver, a paddleboarder, a rower, a marvelously skilled mold and model-maker, a competent photographer and a sailor. Beyond that, however, he traveled, surfed, and lived in a way that would become an invisible template for many of today’s surfers. But, those accomplishments aside, he was also something of a mystery, an enigma, wrapped in anecdote—now obscured by the passage of time. Larson lived to surf. It was his passion, his sustaining quest, and became his over-riding way of defining himself as a man. In the late 1930s, witnessed by a group of his peers, he rode the largest wave anyone had ever seen ridden in California—a wave so big it outlived the man who rode it. After an epic and near-disastrous voyage in 1949, Larson may have been the first to surf in Tahiti. For Larson, nothing but surfing and the ocean mattered. He had no ego-image to sustain, no rewards but surfing itself, and sought nobody’s approval for being a surfer. He never held a long-term job, owned a house, married or had children. Today, a non-traditional life such as this is still considered rare. In Larson’s time it was unheard of. He resolutely and without fanfare defined himself by his freedom to surf, unattached and unburdened. George Larson died “schooner rigged” in 1986 leaving only the barest of historical footprints. In over three years of digging and research only a few documents and a few dozen photos were uncovered. It would all fit in a single mailing envelope. Peanuts had sailed on across life’s reef without leaving a wake. Craig Lockwood grew up in Laguna Beach learning to dive, row, paddleboard, sail and surf. A feature in The Surfer’s Journal prompted the Croul Family Foundation to commission Lockwood to fully explore Larson’s life. Lockwood had the credentials. A Laguna Beach Lifeguard in college, he became the city’s first full-time lifeguard. Lockwood rowed a dory from Santa Barbara to Ensenada, Mexico, competed in cross-channel paddleboard races between California’s Channel Islands, as well participating in a team that paddleboarded from Key West, Florida to Cuba. A contributor to the first surfing magazines, Reef and Surfer, his career in journalism began with Laguna Beach Post newspaper, leading eventually to the Times-Mirror syndicate. Lockwood went on to become an editor for Surfing Magazine, and a Project-Director/Editor for Surfer Publications. 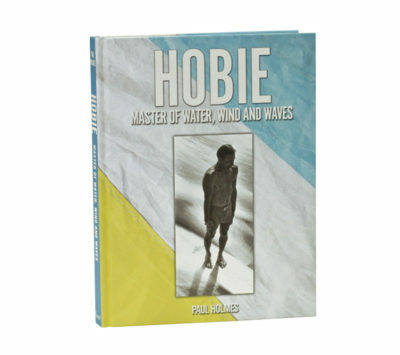 His features and fiction appear periodically in the prestigious Surfer’s Journal. Surfing assignments took him from North America, to Puerto Rico, South America, Australia, Europe, Africa, and throughout the islands of the South Pacific. Lockwood is a lifetime member of the United States Marine Corps Combat Correspondent’s Association and the International Combat Camera Association. He has authored nine books.